Speaking of Charleston, Sean Brock recently took Vanity Fair on a camera phone safari of the ongoing work at Husk Nashville. New York Magazine's Vulture blog ranked all 27 seasons of The Real World and it's a pretty fascinating read. If you haven't, James Walcott's piece in this month's Vanity Fair on hero worship and scandal in sports is a pretty great read. The upcoming Cold War Kids album is streaming in its entirety on the Huffington Post. NPR's Tiny Desk concerts are moving ... presumably to another locale with a similar tiny desk. A Brooklyn band stokes the discussion on music piracy with a Times Square billboard. We're going to have to wait a little longer for that new Vampire Weekend record. "Friday Night Lights" writer Buzz Bissinger has spent nearly half a million bucks on designer clothes in the last three years. Those henna tattoos might not be as temporary as you think, the FDA warns. Saveur has a post on the history of Easter candy. Awesome cast portraits for season six of Mad Men. In honor of Ole Miss guard Marshall Henderson, Sports Illustrated's Extra Mustard blog recaps some of the greatest middle fingers in sports history. Recently released cookbooks by chefs at Charleston's Hank's Seafood Restaurant and The Peninsula Grill are not for novices, the Charleston City Paper's Robert Moss writes. Does Frank Bruni miss being a restaurant critic? His op-eds seem to indicate as much, says The Braiser. Writers at this Los Angeles ad agency are ridiculously good at shooting mini-basketballs. 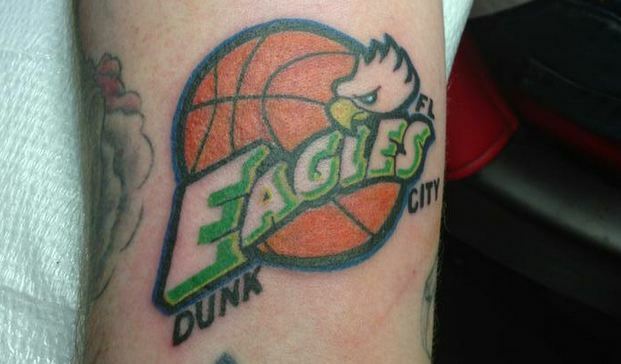 Because it was only a matter of time: Fan gets an FGCU tattoo. Dope aims a laser pointer at an airplane and gets more than two years in prison. Russian organizers have already begun hoarding snow for the 2014 Winter Olympics in Sochi. Esquire on college basketball's most exciting play -- the ill-advised shot that actually goes in.